GIS People is the proud winner of the Export Award at the Queensland Spatial Excellence Awards! The annual QSEA took place on Saturday 12th September 2015. 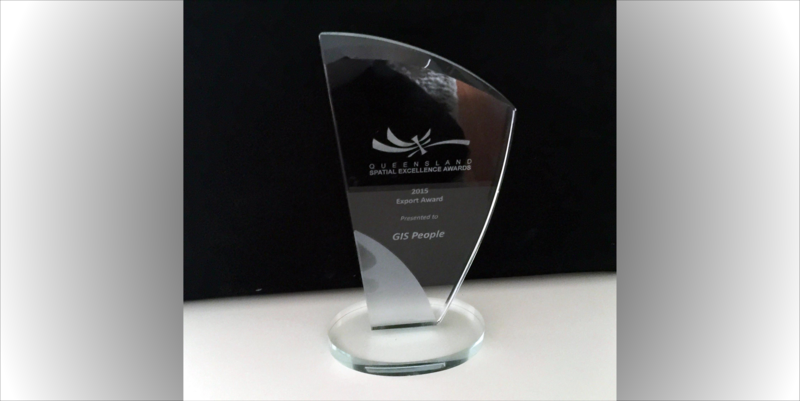 GIS People won the Export Award for their Gruntify software product, a cutting edge system composed of a front-facing field capture app for use on mobile devices, and a web-based administrative interface facilitating data management workflows, reporting and mapping. Gruntify was bought by Queensland Government earlier this year. GIS People is now receiving strong enquiries and expressions of interested from around the world. Through direct contacts with Trade Commissioners in North America and the Middle East they are actively pursuing these leads and opportunities. In addition to winning the Export Award GIS People was also a finalist in the Innovation and Commercialisation, People and Community (for eLearning platform Discover Spatial) and Technical Excellence categories. QSEA, hosted jointly by SIBA and SSSI, acknowledges organisations and individuals for their contributions to the industry, government and the community for the promotion of spatial information, technology and services.